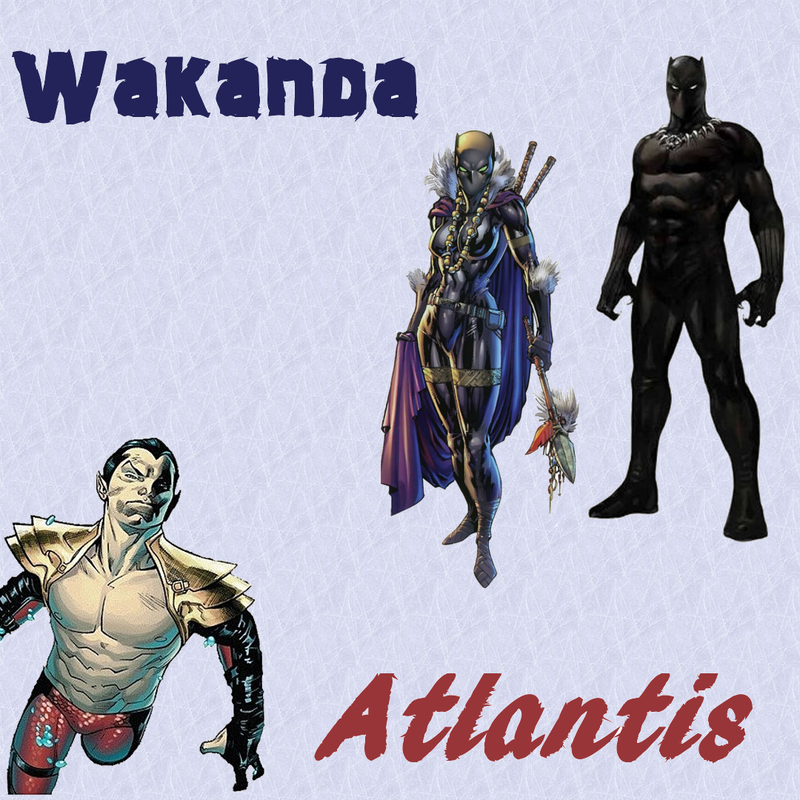 [This is Part 2 of a multiple post series going over the details of one of the most important moments in the Black Panther mythos: The Wakanda/Atlantis War. Avengers vs X-Men was not kind to Wakanda. When the Phoenix was first seen coming toward Earth, Storm was actually apart of the Avengers, not T'challa. Due to the potential extinction level event, Captain America called all Avengers, past and present, to meet at the mansion to discuss the plan. This included T'challa. However, Storm quickly realized she need to be with her people... meaning the mutants. Not the Avengers. And eventually, not Wakanda. T'challa on the other hand, naturally joined the Avengers. Both T'challa and Namor were present when the Avengers first stormed the beaches of Utopia, although they did not have a direct confrontation. Once Hope escaped, the fighting spread throughout the world, including around Wakanda.. lead by the Queen of Wakanda. Yep, she brought a Nazi into Wakanda. Bast have Mercy. T'challa and Storm actually got into a huge fight that resulted in Storm throwing her ring at T'challa. This will be covered in a later installment as the whole divorce deserves its own post. I'll link when i get it up. Soon after, Namor got a portion of the Phoenix power after Stark accidentally split the Phoenix force. With the power of a God in the hands of a hot headed, arrogant, short thinking monarch was not the best thing to ever happen to Wakanda. Initially following the formation of the Phoenix 5, T'challa tried to keep Wakanda out of the hostilities. When the Avengers decided to extract Hope, T'challa specifically refused to be apart of it. However, following the decision of the Scott to hunt down the Avengers, T'challa used Wakanda as a base for the Avengers while he and Tony Stark tried to figure out a way to defeat them. Thanks to World of Wakanda, we know that Atlanteans were hanging around Wakanda around this time, looking for the Avengers. We can only assume that, as King, Namor is the one that sent them there. The Dora's were tasked with finding and eliminating the threat. Things came to a head after the accidental capture of the mutant Transonic. This is actually a panel that is hotly debated by Black Panther fans. At the time of AvX, Shuri was actually Queen of Wakanda, not T'challa. T'challa only recently became King of the Dead prior to AvX. Shuri is the one who would have had to OK any Avengers activities in Wakanda. And Shuri was the one that ultimately ordered Transonic's capture. But... other than this one single panel, Shuri is nowhere to be seen during the event or shortly thereafter. So was Namor flooding Shuri's fault in the end for allowing the Avengers to be in Wakanda in the first place? Or is it T'challa's as the writers of AvX basically ignored Shuri outside of that one panel? It isn't really fair due to the garbage writing, but as Queen, Shuri unfortunately catches the blame here in my opinion. Unfortunately, no one higher up in Marvel treats the Black Panther mythos with any respect so we never got a tie in looking into the decision to house the Avengers there. We can only assume that T'challa asked Shuri, likely convinced Shuri, and Shuri eventually gave the order for it to happen. Either way, Namor did not take kindly to the capture of Transonic. Especially not after he was easily defeated by the Scarlet Witch, heated at the decisions Cyclops was making, and was eventually egged on by Emma Frost. After that, there was only the war.